Dear Father, I been trying to find and answer to a question about Ad Orientem worship facing west. Is it licit? Can churches hampered by modern architecture still worship Ad Orientem? Thanks in advance. From the earliest days, and in keeping with the prayer practices of the Jews (cf. Ratzinger), our forebears thought Christ would return in glory from the East. Moreover, if I remember correctly, after her apparitions at Fatima, Our Lady disappeared into the East. Celebrating “towards the East… ad orientem” is symbolic. It doesn’t have to be the literal geographic East. It is ideal to be able to face the literal geographic East, but we can create a liturgical East in any direction. So long as you are all facing the same direction, you are symbolically facing the East. Thus, we turn to the Lord who is coming. You might try a few reading sources. 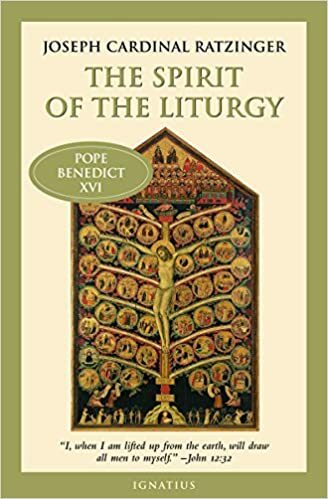 First, there’s the indispensable The Spirit of the Liturgy, by Pope Benedict XVI, aka Joseph Ratzinger. In this he has a deep reflection on the meaning of worship ad orientem. 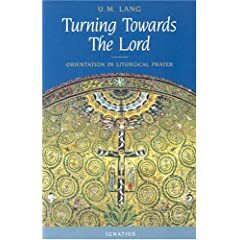 Also useful is “Turning Toward the Lord: Orientation in Liturgical Prayer” by my friend the Oratorian Father Uwe Michael Lang. This entry was posted in "How To..." - Practical Notes, ACTION ITEM!, Liturgy Science Theatre 3000, The Coming Storm, The future and our choices, Turn Towards The Lord and tagged ad orientem. Bookmark the permalink. 18 Responses to ASK FATHER: Can modern architecture churches have “ad orientem” worship? Having lived atop the hill directly east from the Capelinha, I was always happy to remember that Sr. Lucia wrote that our Lady both came from the east and went to the east. Not sure the question was addressed. It sounds like the readers’s question was about modern “churches in the round”, those weird “see from all directions” altars, churches that look inside and outside like a Star Trek set, where nobody is facing the same direction because they are all facing each other, etc. dbonneville: The modernity or idiom of the architecture is not a problem. The Roman Rite can use anything. That’s part of he genius of the Roman Rite and Romanitas. For example, here in Madison we have had the summit of the Roman Rite, Pontifical Masses at the Throne, in modern settings. As far as Masses “in the round” are concerned, again, I say that Romanitas is adaptive. There is, for example, an ancient round basilica in Rome, Santo Stefano Rotondo al Celio. Santo Stefano is a titular basilica, hence for a great many years bishops, cardinals, would have pontificated within. If it can be done there, it can be done elsewhere. The building has to have an orientation of some sort and the altar has to reflect that orientation. Hence, even one of these round churches can be used. Surely yes, yes it is licit, to the the questioner. Given the great variety of church shapes, layouts and sites, the phrase applicable would be liturgically ad orientem, or something approximating that. I’d illustrate from what I know. I’d mainly hear Sunday High Mass and one or two weekly Low Masses in a Dublin diocesan church which follows a north south orientation. It is an EW Pugin style (not designed, George Ashlin, married to Pugin’s sister, and onetime understudy and business partner was the architect) church of the later nineteenth century, but if it followed the traditional orientation, like the nearly contemporary (slightly later) and nearby Anglican church for the same old civil parish, it would have had a tiny capacity even it used galleries or other fixes for awkward sites. Cardinal Cullen suggested the north-south orientation as it made far better use of the site. All nearby churches to me, between the early sixties and mid seventies, actually have the traditional orientation, if usually not the layout, as space was no issue. All have altars so placed according to regulations of Archbishop McQuaid after V2 and Sacrosanctum Concilium, which would allow Mass be offered ad orientem or versus populum. The only blockage, apart from the attitude of some parish priests, are some fairly poor looking potted plants. Other (arch)dioceses did not have that, which meant altars moved too far forward, or if a new build, altars placed too far forward. Ad orientem would not be safe, and that’s not counting a cold hostility some bishops have to anything even vaguely questioning of the then and still prevailing ‘Spirit of Vatican 2’ reading of the Council. I think that it would help clarify things for some readers to mention that The Spirit of the Liturgy notes that Christ is the true Oriens, the East towards which we look in hope, of which the geographic east is a prefigurement. So, the essential quality of worship ad orientem is that the priest celebrate the Holy Mass facing Christ in the tabernacle. This is also why Pope Benedict, in the same book, proposes that, where proper ad orientem worship is not possible or practical, the priest places a crucifix on the altar, so that he can at least have a visual representation of Christ the Oriens before his eyes while offering the Most Holy Sacrifice. My home parish was dedicated in 2009. The altar was intentionaly spaced equidistant from the tabernacle and the sanctuary steps for the very purpose of allowing the potential for ad orientem worship. Also fun: Said distance is my height plus a few inches. I was on the parish building committee before joining the seminary; using me as a measure for prostrations started as a joke but evolved as I discerned. My diocese ordains transitional deacons at their home parishes, so I even got to use the bespoke area; it fit like a glove. Prayerful: it’s very usual in countries like Ireland, where Catholic churches could only be built, or allowed to be built, in very restricted places because of official oppression, for them to be sited in any way that was convenient, for space and economic/financial (we were poor) reasons. All the older Medieval churches, either taken over for the State protestant church or reduced to ruins, as so many were, will always follow the Eastern orientation, because they could! Space wasn’t a problem when they were founded. But in urban sites, when the Church could freely build again, to restore that which had been raped from Her, it usually just wasn’t possible to build ad orientem, or if possible it would have resulted in an ugly structure. Hence, many are not ad orientem – Dublin’s Pro-Cathedral is oriented West/East, because it was built in the time just before Catholic Emancipation in 1829 and is “stuck” down a side-street. And even after 1829, in the towns, Catholics building new churches usually couldn’t get a site that would permit proper orientation. But, as Fr. explains, it didn’t matter, because of the concept of “liturgical east”. What does hurt, however, is when a church actually did face east… the New Springtime insisted on throwing it all away and instituted the self-referential set-up with which we’re all familiar. And that’s worked, hasn’t it? Father, I vaguely recall reading that, in St. Peter’s Basillica the priest, offered Mass facing east – facing the people (at the main altar). However, during the Canon, the people would then turn (with their backs to the priest) to face east along with the priest. I do not recall where I read that, or if that was in fact the practice there. A church where we attend Mass fairly regularly is one of those 1960’s “church in the round” with the sanctuary in the middle. As my teenage son noted recently lots of people sit in the chapel and effectively get ad orientem worship, and none of them are having a “spittle-flecked nutty” about it. The Basilica of the National Shrine of the Little Flower in Royal Oak, Michigan, is a church in the round in a sort of art deco and craftsman style. I happen to like it. It was completed in 1936. It clearly was designed for ad orientam worship with an absolutely circular (octoganal) layout. Also: the TLM was said for centuries in the very round Pantheon. Whether altars in particular Churches face East is not a 20th century issue. All the altars in Westminster Cathedral face in the same direction as the High Altar which is East facing. At the London Oratory all the altars face the outer walls and are in many different orientations. There must have been guidance on this prior to the Vatican Councils. Unless I am mistaken, Our Holy Father has celebrated ad orientem in the Sistine Chhapel on epiphany every year. Pope Benedict began to do it, and I am pretty sure Pope Francis has continued the practice. As Fr. Z points out, he has celebrated ad orientem on other occasions as well. I am not sure what the occasion is for this Mass, but I am pretty sure that the “ubi caritas est vera” is not part of the ceebration, since it does not break with the cuts in the video. That should have said Baptism of the Lord rather than Epiphany. OK I’ll give an opinion on this one. Many old European churches not oriented have a separate chapel of the Tabernacle eastwards — and I have attended one Eastertide or Christmas time Mass (can’t remember which) when our Priest asked us to pray geographically ad orientem — prior to the Consecration I can reassure you, the purpose was clearly and beautifully expressed that Prayer to the High Priest ad orientem to bring His Consecration to our Offerings and Sacrifice is worthwhile towards our Salvation.